Home>Is your home experiencing electrical problems? Look for the signs! Is your home experiencing electrical problems? Look for the signs! Here’s something we bet you didn’t know: did you know that in 2015, there was an increase in cases of preventable fires in Victoria? On average, firefighting authorities dealt with an astonishing eight cases a day! Yes, in 2015, firefighters across the state were dealing with more fires compared to the previous year. It’s a scary and saddening thought. One of the common causes of these kinds of fires was that of faulty electrical appliances. A fire caused by faulty electricity can and should be avoided. Just like the saying, “Prevention is better than cure”, the key is to identify if your home is experiencing any electrical problems as early as possible. This week, we’re providing a rundown of some signs you should look out for as these are indications of an electrical problem. Shock me, shock me, shock me! Have you ever tried to plug any home appliance and experienced that split-second shock? You may well have just experienced an electric shock! An electric shock can be awfully dangerous. If you are lucky, nothing major will happen to your body. But take the experience as a sign that something is not right. Electric shocks may be attributed to an issue with the appliance itself or the wiring. It only takes one electric shock incident to know that something is faulty, so don’t ignore this loud sign. Bulbs burning out too soon? 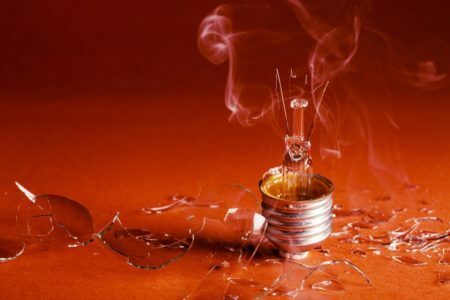 If your light bulbs at home are burning out earlier than they should, it’s sign of a potential electrical problem. problem goes beyond just the fixture. If you think one or two issues look familiar, it is best to reach out to an electrician so you can find out why your bulbs are burning out before their Average Rated Life (ARL). Sometimes when lightning strikes, we experience some sort of electrical surge that normally results in our power being cut. Besides wild weather, an electrical surge is mostly caused by something inside your home. When a surge occurs, a disruption in your electric supply has occurred. Frequent electric surges are bad for your appliances and gadgets. Not only can they damage appliances, electric surges can also cause house fires! If you are experiencing electrical surges in your home, you must call an electrician to assess and address the problem. An electric surge is a serious matter and if left unattended may endanger life and property. Electricity is extremely dangerous – we all know this. No matter how small you think your home’s electrical problems are, the only choice you have is to use a professional and qualified electrician. If you notice any changes in your home’s electrical activities – whether it’s a minor matter like a switch not working as intended or as major as a voltage fluctuation – you have to let electricians take care of them. It’s so important to detect and to solve any electrical problems in your home as early as possible. Don’t ignore the signs, and remember that electrical problems are one of the causes of preventable fires. Take care of the things and people you value the most. Do you need a commercial or domestic electrician? Call the Briggs Electrical team now!